Deutsch announced today the appointment of two new partners, tapped to help the agency expand its tech and digital services for clients. The agency added Trevor O'Brien as partner and chief technology officer in New York and elevated Pam Scheideler to partner and chief digital officer in Los Angeles. The promotions are both effective immediately. In the past five years, the agency said its digital revenue has grown from roughly 5 percent to 40 percent of overall revenue. With that in mind, Deutsch North America chief digital officer Winston Binch told Adweek now was the right time to invest even more in those two areas. "We're putting digital at the top of the company so it's not a tertiary or secondary priority, but it's a primary one," Binch said. "When we use the word 'digital,' it's much broader. We do content, social, banners, etc. … But we're also focused on enterprise-technology development and commerce." 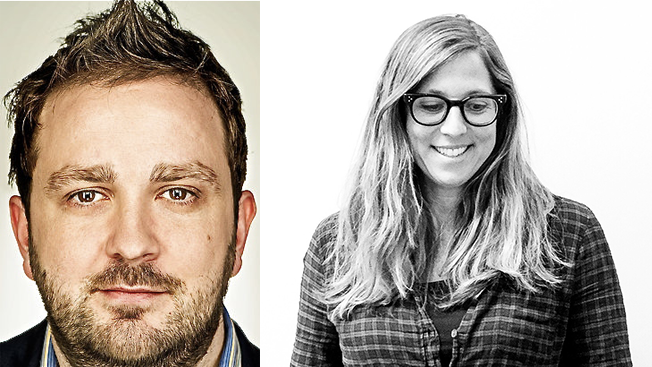 Scheideler joined Deutsch in 2013 and most recently was executive director of digital, while O'Brien did a stint at the agency's L.A. shop from 2011 to 2014 as an executive creative technology director. Most recently, he worked at design and tech studio The Experiment. "I'm excited to be part of the Deutsch team again," O'Brien said in a statement. "They are always moving forward, testing boundaries and have an intense entrepreneurial vibe. We'll continue to be makers, investors, entrepreneurs and inventors and that's just on Mondays." O'Brien, who will report to Binch and New York CEO Val DiFebo, will be tasked with running the technology teams in both offices across all of the agency's accounts. Deutsch will also rely on O'Brien's connections in the startup scene to foster relationships and develop partnerships within that community. As chief digital officer, Scheideler will be tasked with continuing to develop new and innovative products for clients like the new commerce platform she worked on for Taco Bell, Ta.co. She also helped launch the "Unleash Your Rrrr" AI experience for the Volkswagen Golf R.
"Pam is going to focus on growing the platform business but also social," Binch said. "We're seeing a huge amount of demand for it. There's more pressure for brands to develop content outside of 30-second spots now." In a statement, Scheideler called Deutsch "a place where business-changing tech ideas are happening all over the place," adding, 'not just in prototypes or specialized areas of innovation, but real projects to solve real business problems."